The California wildfires that hit the country starting from mid July have been recorded as one of the most destructive ever, with the Camp Fire being the deadliest with at least 42 people dead and more than 200 missing as flames torch the Northern part of the country. 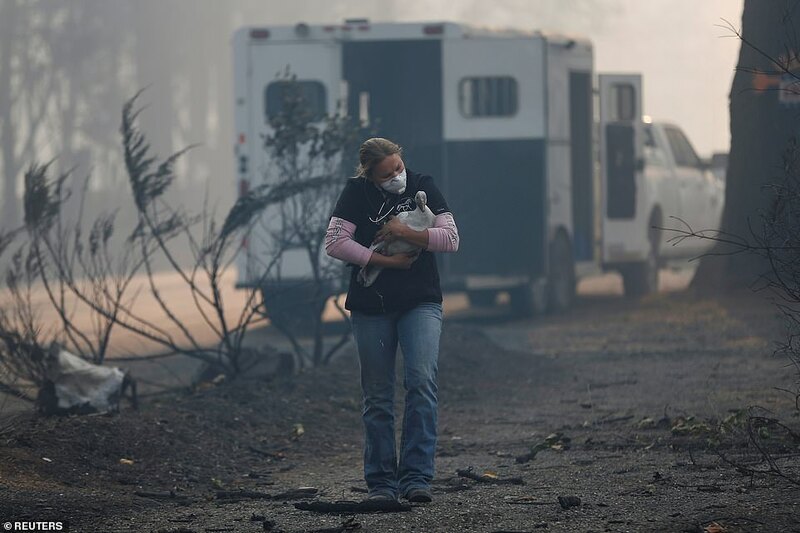 On Tuesday only, the number of firefighters who were battling the wildfires was around 9,000, and while they struggle to help the residents, animal rescue workers are risking their lives to rescue and treat hundreds of injured wild animals and household pets in the wake of the devastation. 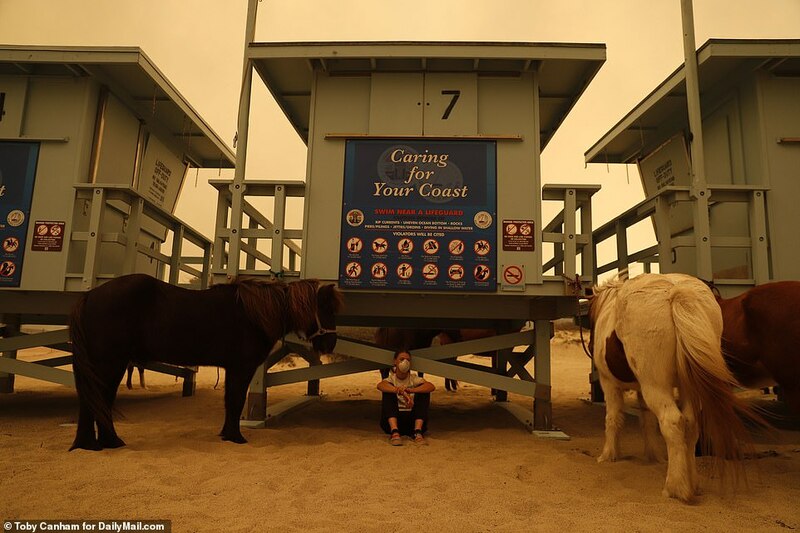 Zuma Beach was opened up by the authorities as an evacuation point for large animals such as llamas, donkeys, horses, pigs, and even a giraffe, leading to surreal scenes. The fire also struck the homes of many celebrities, as it approached the Pacific Coast Highway. 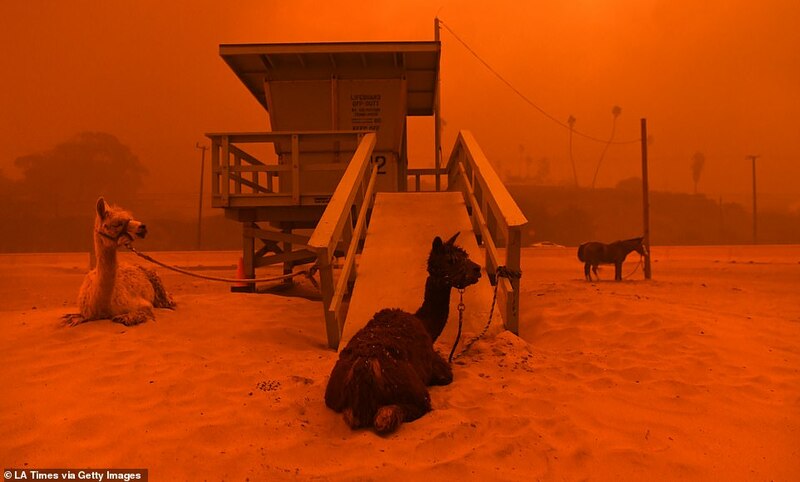 Llamas were tied to a lifeguard stand on the beach in Malibu as the Woolsey Fire comes down the hill Friday. Rescued animals were corralled on Zuma beach in Malibu, California. This included llamas (pictured). 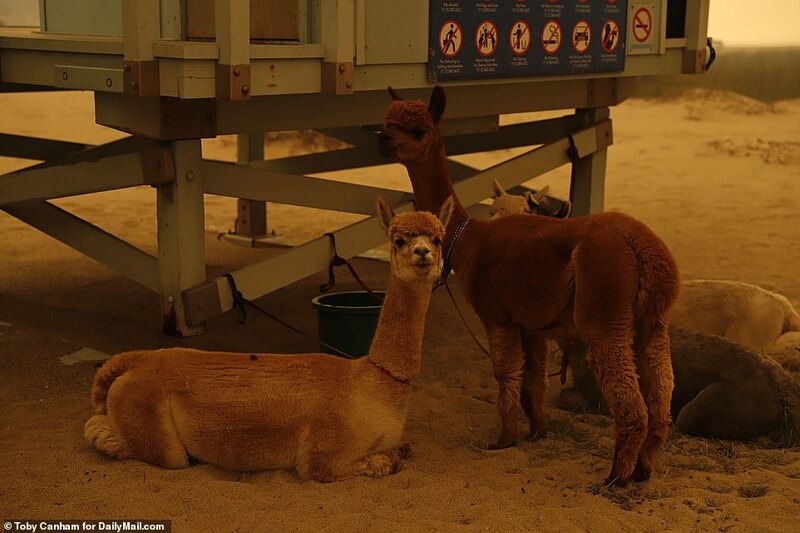 Nina Hungerland, 20, could be seen with rescued animals on Zuma beach in Malibu. 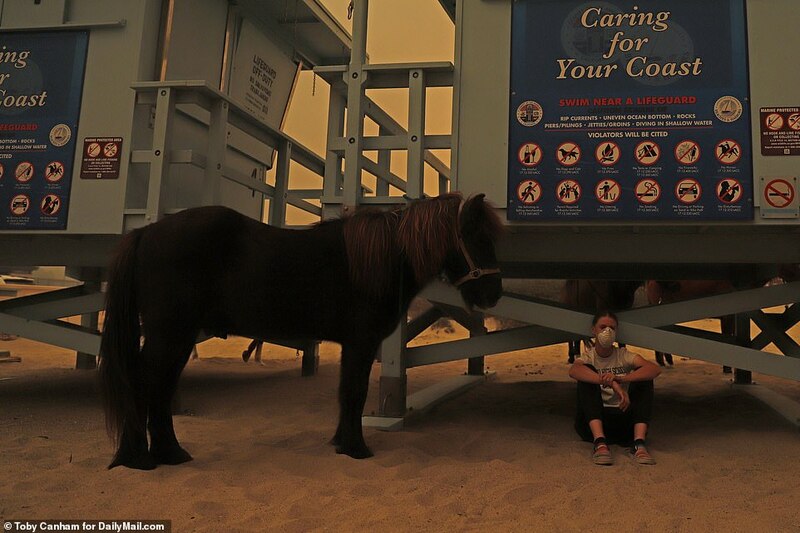 The animals dealing with the thickness of the smoke as the fire fast approached the Pacific Coast Hightway included horses. 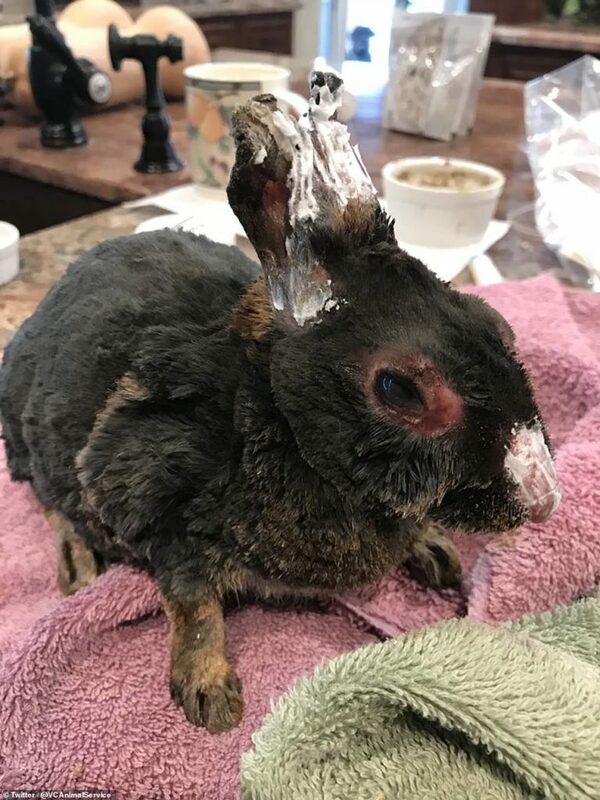 A badly burned bunny was rescued from the fires and treated for its wounds. 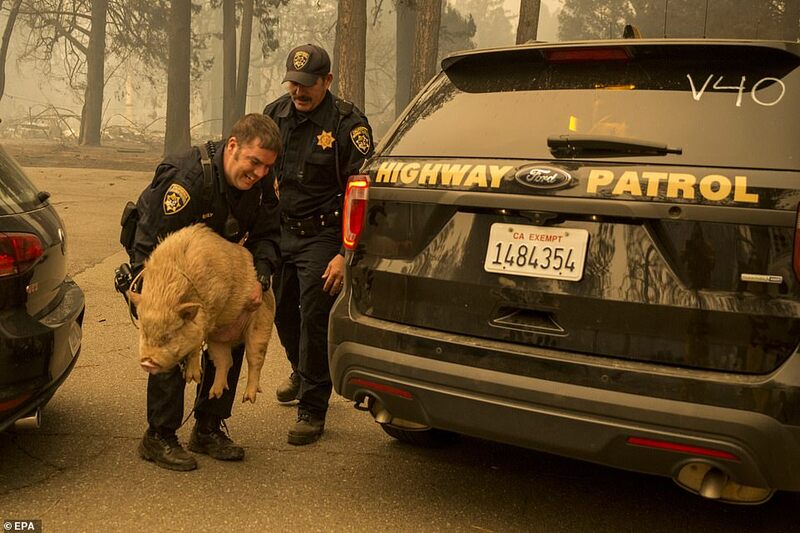 California Highway Patrol officers attempted to transfer a potbelly pig they rescued to Butte County Animal control officers in Paradise Friday. 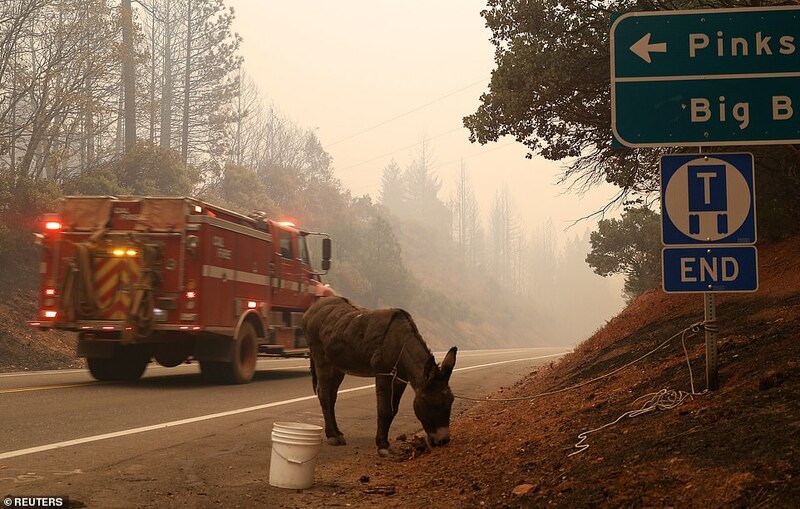 A rescued donkey stood tied to a road sign on the side of the road after the Camp Fire moved through the area Friday. 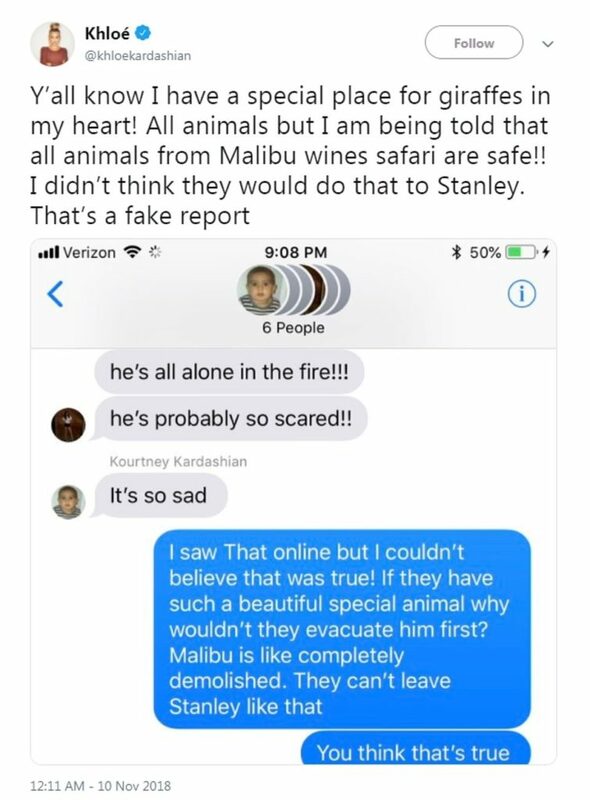 Many celebrities, among which the Kardashians and Ariel Winter posted on the social media, expressing concerns for the animals, especially for a giraffe from Malibu Wines safari named Stanley. 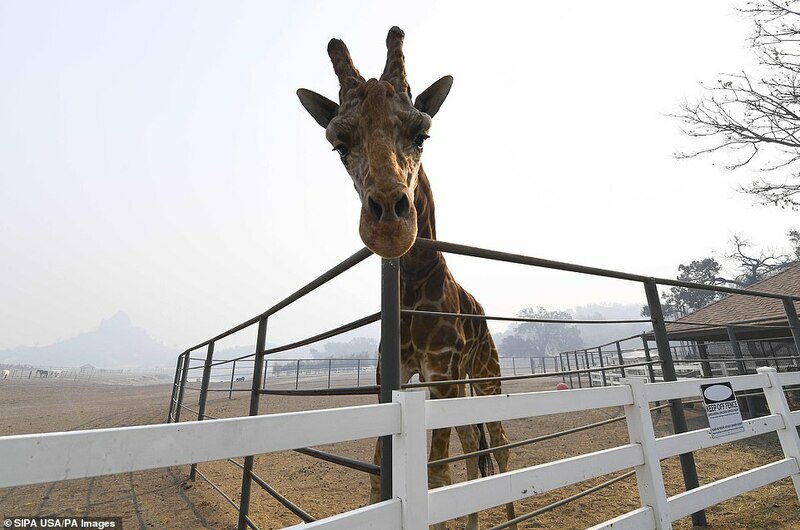 Khloe stated how her heart has a very special place for these creatures, which we already know as we remember a 2012 episode of Keeping Up With the Kardashians, when she received an inflatable giraffe as a gift from now ex-husband Lamar. However, she was generally concerned for all the animals from the Saddlerock Ranch. The poor creatures were shrouded in smoke in the aftermath of the Woosley fire. Thankfully, besides many buildings and properties being damaged and destroyed, the ranch animals survived. 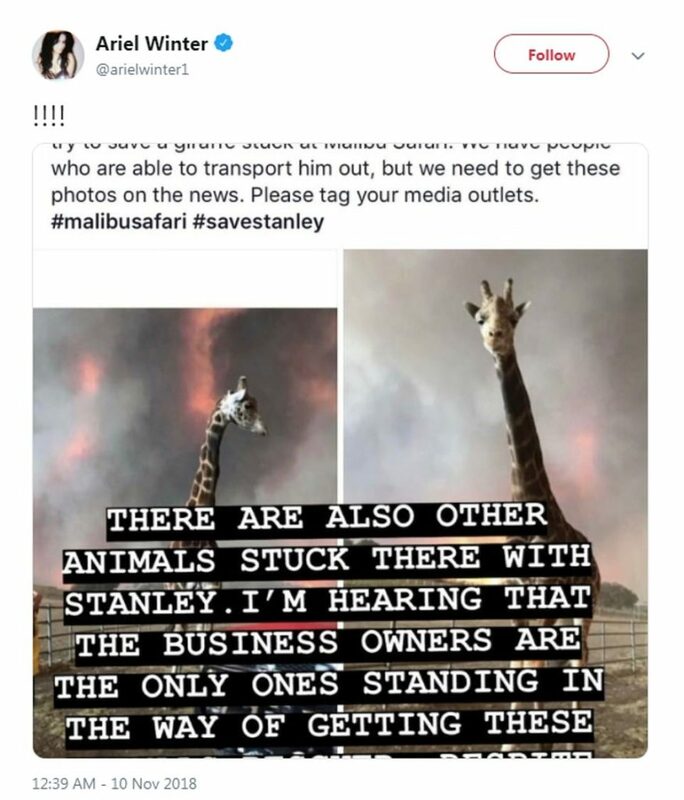 Ariel Winter also posted about the giraffe to Twitter, sharing pictures where the fire can be seen in the background. 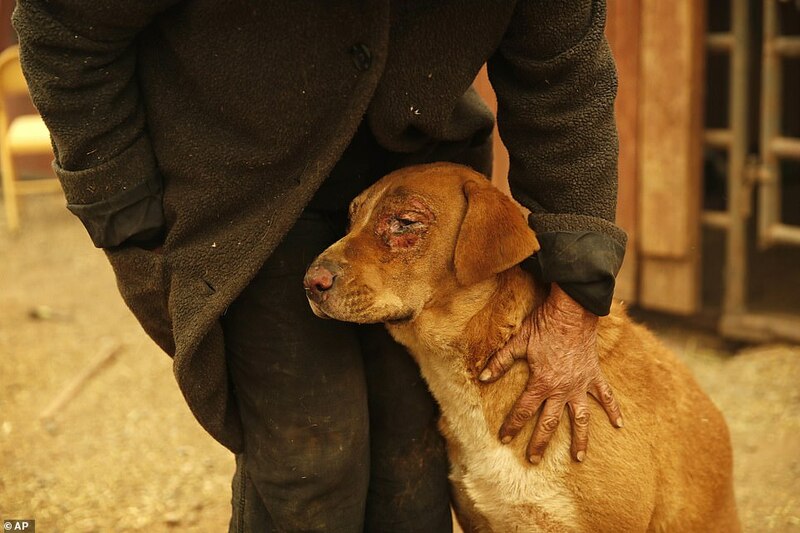 Wrenching images of injured animals and pets have been shared on social media. Volunteers and animal lovers could be seen taking care of geese, dogs, tortoises, and many more. The number of rescued animals that have been placed in different locations across L.A County is around 600. Pictures and stories of people reuniting with their pets were also shared online. A veterinarian Jesse Jellison was spotted carrying an injured goose to a waiting transport, while Officer Share from Yolo County Animal Services tended to a horse that was stranded. The Camp Fire has already burned through 109,000 acres and destroyed 6,713 buildings – most of them homes. As of Sunday morning, it was 25 per cent contained. Equine veterinarian Jesse Jellison carried an injured goose to a waiting transport during the Camp Fire in Paradise Saturday. 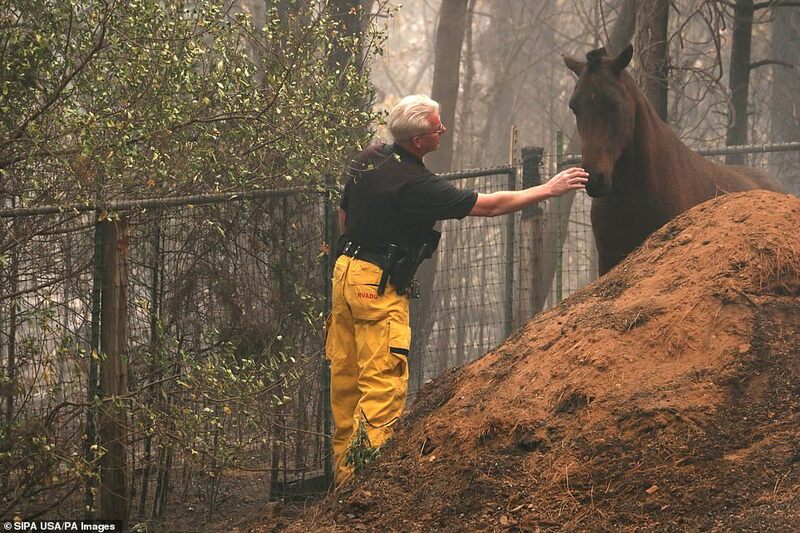 Officer Share from Yolo County Animal Services tended to a horse that was stranded during the Camp Fire in Paradise. 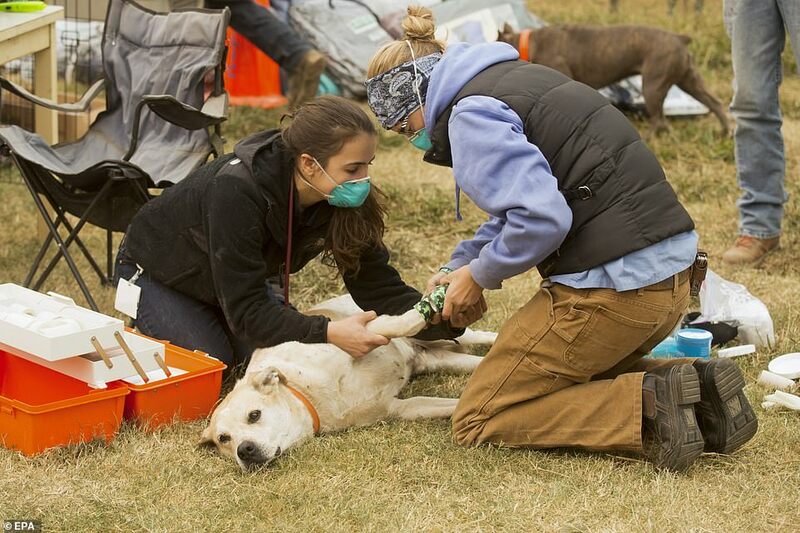 Members of the UC Davis Veterinary Emergency Response Team, Ashley Nola (left) and Catherine McFarren (right), tended to burns on a dog that was brought into the Butte County Fair Grounds where large animals were being sheltered. The Woolsey fire that hit Malibu has burned over 96,314 acres of land and destroyed an estimated 435 structures. Around 265,000 people were evacuated, but unfortunately 2 were killed. Celebrities’ million-dollar properties were completely destroyed. Photos of the devastating scenes were shared by Miley Cyrus, Neil Young, and Gerard Butler who were among those who lost their homes. 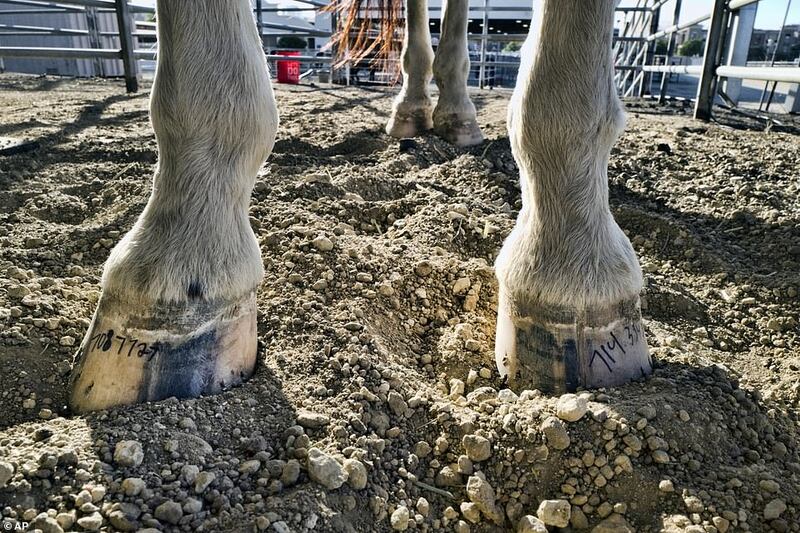 An evacuated horse had contact phone numbers written on her hooves as she waited in a shelter at the Pierce College Equine Center where evacuees were bringing their large and small animals in the Woodland Hills section of Los Angeles on Friday. 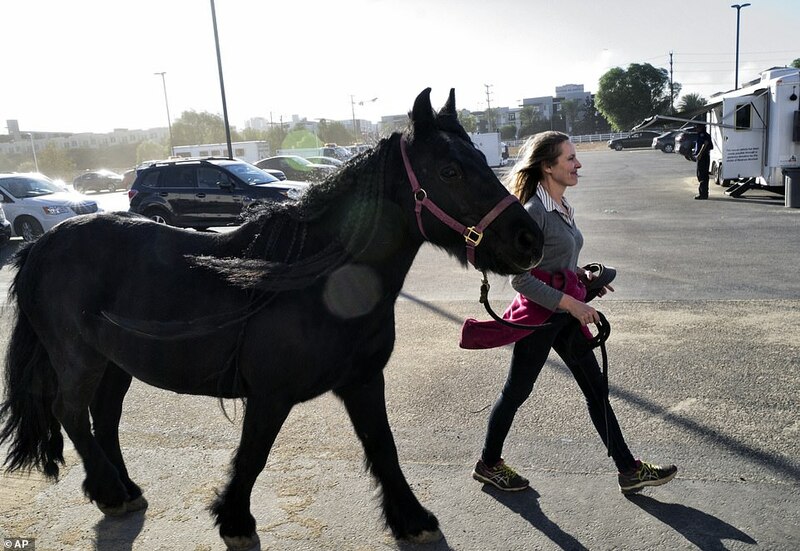 Wildfire evacuee Eva Loeffler walks with her 20-year-old pony Mini at the Pierce College Equine Center. 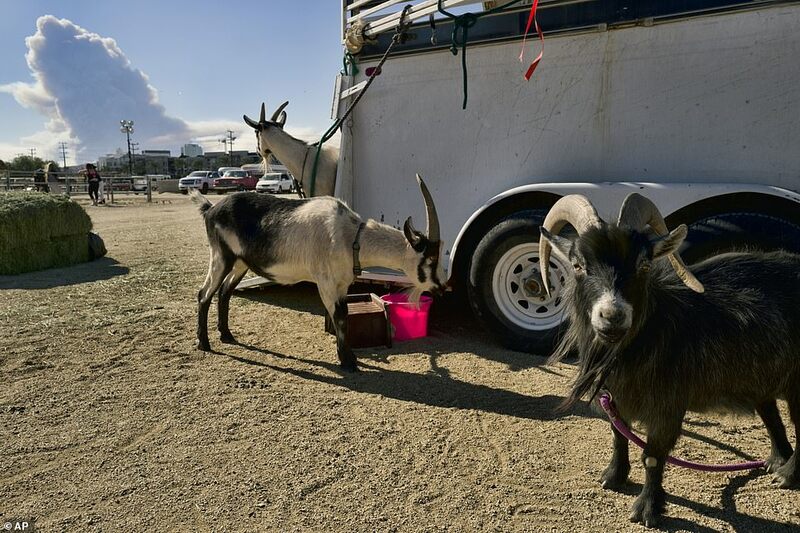 Goats were cared for at The Pierce College Equine Center where evacuees are bringing their large animals. 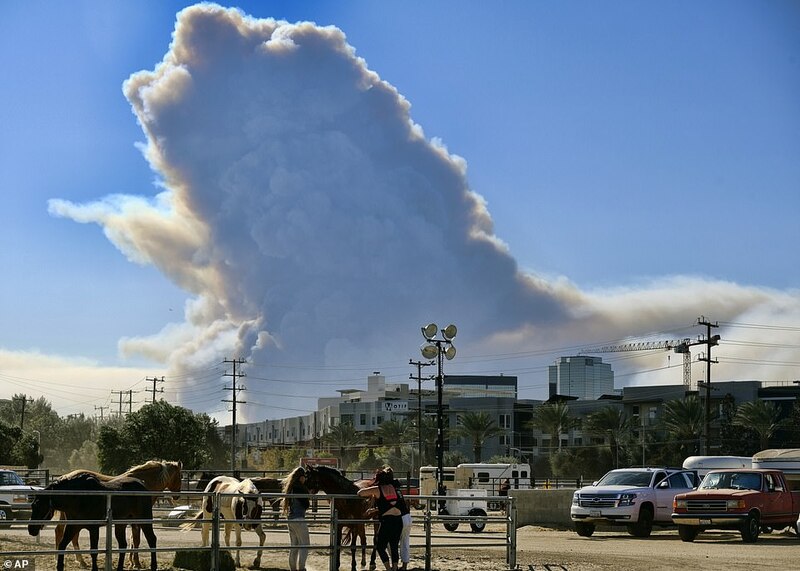 Large plumes of smoke from a fast moving wildfire were seen in the background as volunteers cared for evacuated horses at The Pierce College Equine Center. 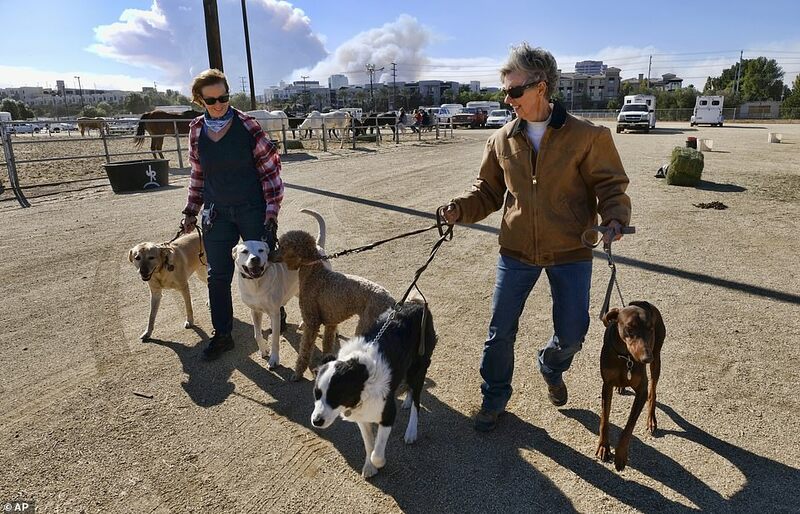 Teresa Merritt, left helped her sister Mary Lou Miller with her dogs after being evacuated at The Pierce College Equine Center where evacuees are bringing their large and small animals in the Woodland Hills section of Los Angeles on Friday. Cathy Fallon was with her dog Shiloh at their home Friday in Paradise, California. Shiloh was burned when a wildfire scorched the property, burning down Fallon’s home. 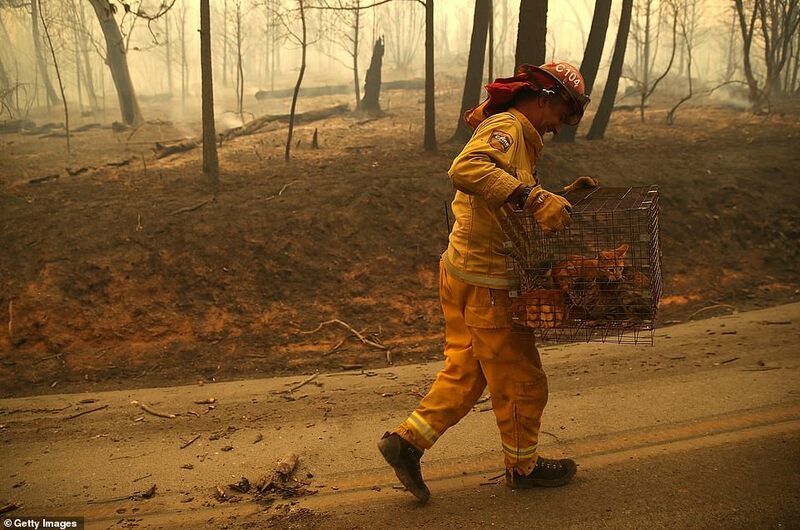 California Fire Captain Steve Millosovich carried a cage full of cats that were found in the road after the Camp Fire moved through the area Friday. 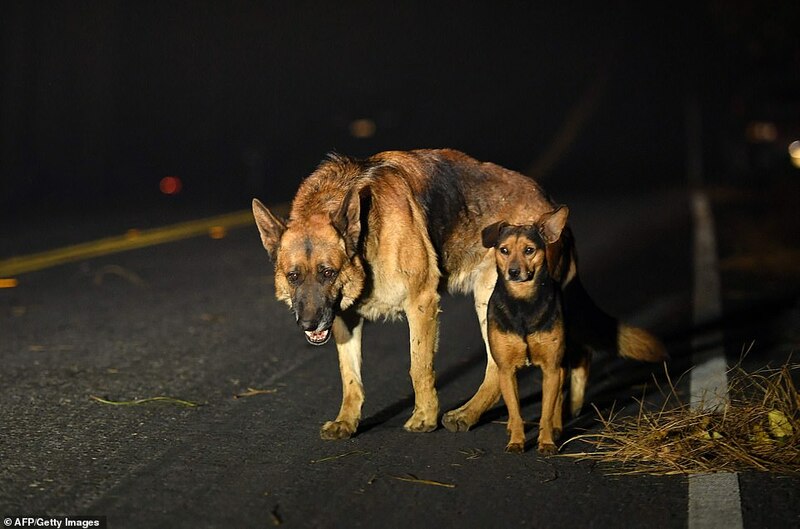 Dogs roamed burned out neighborhoods as the Camp fire tore through Paradise, north of Sacramento, California on Friday. A great number of animals lost their home as well, and were probably beyond scared to witness such a tragedy. Thanks to the brave rescuers many lives were saved. Volunteers tried to save every animal they could, no matter how small they were, because every life matters. In Big Bend, Fire Captain Steve Millosovich carried a cage full of cats that were found in the road after the Camp Fire, and in the same area a donkey was seen tied to a road sign so it didn’t flee. A group of deer and other animals were seen walking through the destroyed properties. We hope no other life will be lost in the most destructive wildfires ever recorded.